We’re now well into 2016 with February already having passed us by, and as usual, ProductHoist brought us a whole host of fantastic startups. We look at the Top 5 startups posted on ProductHoist in February, ranging from hashtag suggestions to cleaning the oceans with a floating rubbish bin! The rideshare economy is now booming thanks to the gigantic success of Uber, but what do you do if you want to get driving with Uber and you don’t have your own car? With Splend, wannabe Uber drivers can fill out a simple online form, and within 48 hours are setup with a pre-approved vehicle for the duration of their work. Splend cars come with maintenance, servicing, registration and insurance included, making it an incredibly comprehensive service. Not to mention your new Splend car is all yours for personal use 24/7 to boot! Say you’re passionate about a certain type of product and want to make a central hub to bring consumers, retailers and sellers together, but are faced with the arduous task of creating your own online marketplace. Making your own eBay, Etsy or Gumtree from scratch is intimidating to even think about, but that’s where Marketplacer comes in. The Marketplacer platform gives you a fully hosted, customizable e-commerce web store, taking out all the hard work of online web hosting and backend shenanigans so you can get right into managing your own marketplace. Boasting a whole bunch of awesome features including blogs, SEO optimization and mobile-friendly sites, Marketplacer has really thought of everything. Great examples of e-commerce sites using this platform include Bike Exchange, House of Home and Outdoria. So what are you waiting for? Get Marketplacing! For anyone wanting to effectively use social media; from online businesses to instagram celebrities, using hashtags correctly is absolutely crucial. Getting your hastags right means getting your posts to the right audience, but how do you know what hashtag to use in this #online_sea of #information? With #IQta! 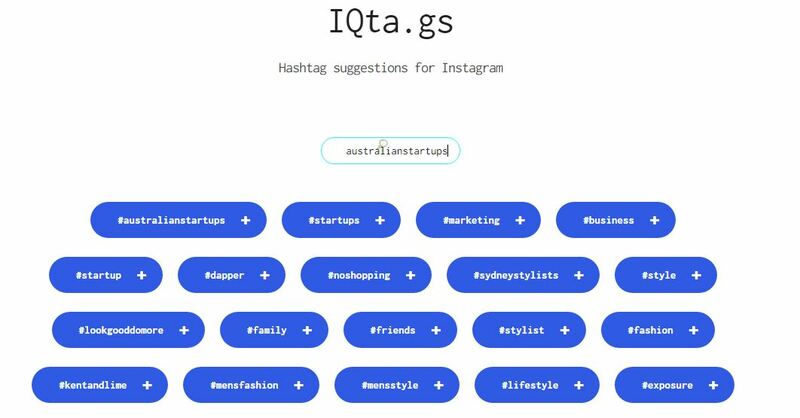 Simply type in the topic or genre of your post, and let IQta figure out which hashtags you should be using. This totally free online suggestion engine is built with Instagram specifically in mind, but the same idea can be applied to Facebook and Twitter just as easily. Fed up with the corporate rat race of desk jobs? Finding something you love and dropping out of your current career overnight is an attractive idea, and makes for good stories for famous people’s biographies, but you probably don’t want to drop everything to go pursue something you may or may not enjoy. With QLC, you can now try out a new career field by matching up with a short-term side project like early stage startups and social ventures. Projects are often remote and flexible, so you can join without quitting your current job and still learn new business, tech and design skills by getting involved. And who knows, maybe you’ll find a new passion and get out of that quarter-life crisis into a career you genuinely love! Cleaning up ocean pollution is a big deal, and in Australia where our beaches and oceans are an unrivaled beauty, there’s no doubt we want to be doing everything we can. The The Seabin project project is diving head first into the problem with their automated rubbish bin which catches floating rubbish, oil and detergents. Originally an indiegogo campaign, the Seabin project was successfully backed in early January reaching a whopping total of $267,667 USD raised funds. The next step is to now physically deploy their seabins in marinas worldwide and begin the process of cleaning up our oceans for good. Learn from over 200 Australians making ideas happen.